Today is August 29 and in one month and a day we leave on our trip, arriving at Charles de Gaulle airport in Paris on October 1 (my bday). We’ll switch terminals, grab a bite to eat and board Tarom Airlines Flight 9382. We land in Bucharest at 7:15 P.M. and the next day the adventure begins! 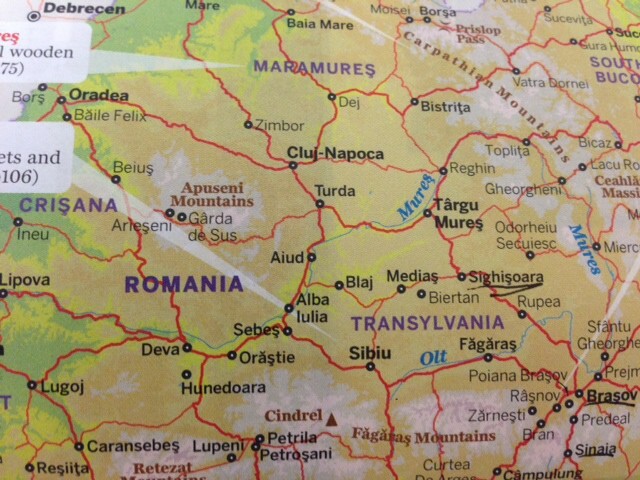 Inevitably we are asked “Why Romania?” and all I can say is there is so much to see and do, I wish I had more than 14 days. As it is we are cramming in Bucharest, Count Dracula’s Castle in Transylvania, the medieval village of Sighisoara, the university town of Iasi, the Painted Monasteries of Bucovina and various places in between. We are missing the Danube Delta and the Black Sea. I’m already thinking “next time”! We shall visit grand synagogues, castles, wooden Saxon churches, traditional villages and always be amidst what looks to be gorgeous scenery. It sounds too enticing, and then there is the price point value. Real bang for your buck. We are staying in hotels that are classified as 4 or 5 star and are not more than $100 night including breakfast! We booked one night at the Grand Hotel Traian, designed by Gustave Eiffel, where I read that John Gilbert and Greta Garbo secretly nestled in the 1930s while they were romantically entwined. Perhaps the accommodations shall not be akin to the Four Seasons, but nonetheless old world luxury from the belle epoque with whiffs of a pre-Ceausescu world. And after Romania we stop four days in Paris. Steve has never been and I have never been to Versailles so it is on the list of things to do. And because we have an extra long stopover in London on our way back- hopefully we shall take the train into the city for lunch. Now I more than anybody knows no trip is perfect. There will be snafus and disappointments and best laid plans that go awry (all of which Steve will weather with aplomb and me with not such great aplomb). But, it will be forever memorable, as every trip always is. That sounds like a glorious trip! Safe travels and memorable adventures to you! Enjoy the trip, Julie and Steve! I went there on a ’59 BMW motorbike back in 1974. I think your itinerary will bring you to the most attractive places, although, as you are saying, the Danube delta would be worthwhile, too. On the same day, I will (as plans stand today) be flying to Istanbul, Turkey, then onward to Bishkek, Kyrgyzstan. Thanks. Are you in Turkey on business or pleasure? I’ll look for posts on FB. Have a good trip!